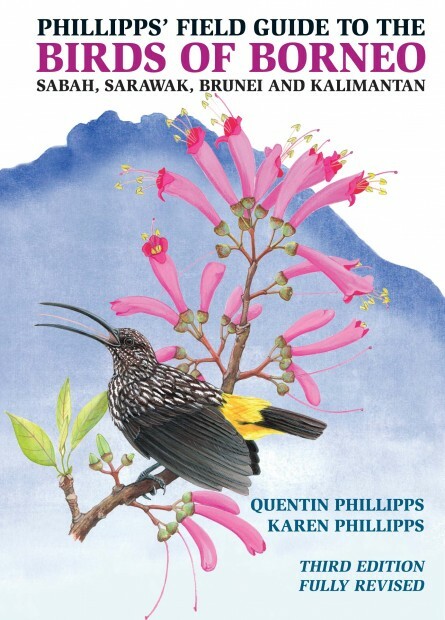 Published to great critical acclaim in 2009 and with a 2nd edition in 2011, this is a fully revised and updated edition of the most user-friendly field guide to the birds of Borneo, covering Sabah, Sarawak, Brunei, and the Indonesian states of Kalimantan. The book gives descriptions of 669 species living or reported on the island, including 51 endemic species.These are superbly illustrated in 141 colour plates with more than 2,000 full colour bird images, including most of the sexual variants and immature forms of polymorphic species. Each plate is accompanied by species descriptions covering taxonomy, size, call, range, distribution, habits and status. Distribution is shown by detailed thumbnail maps. There are 7 habitat plates, 12 regional maps showing Borneo’s top 130 birdwatching sites, fast-find graphic indexes to the birds of Kinabalu, and a full overview of vegetation, climate and ecology. Quentin Phillipps has been interested in the natural history of Borneo all his life. He was born in Sandakan, Sabah and grew up on the Tuaran Rubber Estate. He was educated at Sabah College, Kota Kinabalu, Bedales School and King’s College Cambridge. At 17 he won the Wildlife Photographer of the Year competition (junior section) with the first-ever photograph of a nesting Chest-nutheaded Thrush. He now divides his time between London and Kota Kinabalu. Karen Phillipps was also born in Sandakan and educated at Bedales School then Camberwell College of Arts and Technology, London, where she studied graphic design. Karen has illustrated numerous books on Asian wildlife, including A Field Guide to the Birds of Borneo, Sumatra, Java and Bali; Mammals of Borneo; A Colour Guide to Hong Kong Animals; A Field Guide to Birds of China; The Birds of Hong Kong and South China; and The Birds of Sulawesi. 372 pages, 100,000 words approx. 141 full colour plates, 600 distribution maps, 12 maps.